The nation's bars face the enviable problem of having too much choice. 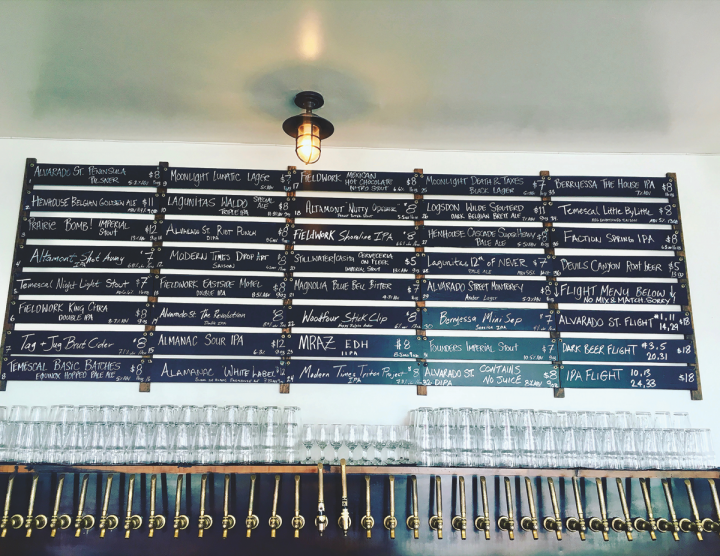 The Crafty Fox Alehouse in San Francisco features a carefully crafted draft menu of 36 beers, ranging from IPAs and barrel-aged brews to Pilsners and pale ales (Crafty Fox drafts pictured). Amid a seemingly endless array of beer varieties and heightened interest in new releases, bar operators sometimes struggle to achieve balance on their beer menus. The Crafty Fox Alehouse in San Francisco offers 36 draft beers—10 to 15 of them are hoppy brews, including IPAs, double IPAs and pale ales. “We also try to have a selection of lighter offerings for our Pilsner, lager and Kölsch drinkers,” says co-owner Barry Smyth. “After that, I like to have a few Belgian-style, barrel-aged and dark beers. We also feature a handful of one-off and experimental labels, as well as local beers.” Draft pours at The Crafty Fox sell for between $7 and $12. Winking Lizard Tavern, which has 19 locations in Ohio, takes a similar approach. With IPAs the most popular brew among craft beer drinkers, the chain devotes about a third of its draft beer offerings to the style. “We like to focus on a brewery’s strength,” says co-owner John Lane. “So we’ll offer a hoppy beer like Stone Delicious from Stone Brewing Co., Fat Tire amber ale from New Belgium Brewing Co. and Dortmunder Gold from Great Lakes Brewing Co.” In an effort to service drinkers who seek out the latest releases, Winking Lizard also devotes three to four of each venue’s roughly 30 tap handles to constantly rotated beers. Draft beers range from $4.75 for a 16-ounce pour of Fat Tire to $15 for a 12-ounce serving of Polycephaly, a collaboration beer between Winking Lizard and Athens, Ohio–based Jackie O’s Brewery. Washington, D.C.–based Neighborhood Restaurant Group (NRG) follows a specific formula, organizing the beer menu by flavor profiles such as “roast,” “crisp” and “hop.” The “hop” brews at its beer-focused Birch & Barley comprise around 15 of the 50 draft offerings, while “crisp” beers account for another five, according to beer director Greg Engert. NRG carries more than 3,000 brews across its 19 beer-serving venues. Balancing selection also comes into play when rotating in new beers. Both NRG and Crafty Fox typically replace a draft with a beer of the same style. At the Porter Beer Bar in Atlanta, however, where nearly all of the 50 beers on tap are constantly rotated, “we don’t follow a strict percentage rule when it comes to setting the beer menu,” says co-owner Molly Gunn. “That’s the beauty of constantly rotating.” If the draft menu seems to be skewing too much toward one style, “we’ll pull back,” Gunn notes. The venue’s packaged beer list, which includes 750 offerings ($3.75 to $300), appeals to guests who find the tap beers lacking. Porter Beer Bar’s draft beers are priced between $5 and $12 for pours of 8 to 16 ounces. Beyond style, other considerations factor into the quest for a balanced beer list. “It’s important to adjust for price point, region and abv,” says Engert of NRG. “We don’t want our guests to be overwhelmed by a list comprised of only local beers. We also want them to be able to find more recognizable beers.” Lane says he also factors in abv for Winking Lizard’s beer offerings. “I’m a publican. I want my customers to have more than just one beer,” he says, citing potent brews that restrict volume purchases.